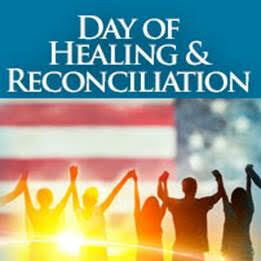 Another response to this election here in the North Bay: The Day of Healing and Reconciliation: Reuniting Our Country after the Election Sunday, November 13. This is a satellite event at the Unitarian Universalist Congregation of Marin, 20 Channing Way in San Rafael. Noon – 3:00 pm. Featuring: Sylvia Boorstein, & Marc Levine, State Assemblyman (D) & Larry Bragman of the Marin Green Party. This is part of a nationwide event organized by The Shift Network. Beginning some form of healing & reconciliation with a wise and beloved teacher such as Sylvia Boorstein sounds to us a wonderful experience, not to be missed if at all possible. It’s worth noting the chilly reception received by Rep. Marc Levine at the recent Petaluma Veteran’s Day parade on Friday, November 11, here in our hometown of Petaluma, California. Many bystanders appeared to still have a bit of a political hangover from the previous Tuesday’s election. Assisting a small film crew covering the parade, I had the opportunity to speak with quite a number of folks and observe the entire event. I wouldn’t describe the mood as anti-political, but definitely fatigued and cranky. Though city politicians faired better, others such as the just-reelected Levine, Rep. Jared Huffman, and Sen. Bill Dodd did not. The three may have been able to elicit a wave and holler here and there, but it was remarkable that for long stretches of 4th and Kentucky Streets the approach of their vehicles brought an icy silence, abruptly ending the scattered applause granted preceding parade entries. A solitary, elderly veteran, tall and lean, he looked to be in his 80s, but could have been considerably older – he marched in silence, holding the middle of a lengthy bar. A banner the length of the bar demanded the U.S. accept “Not one more Syrian “refugee”‘ until all veterans are cared for. It seemed a hateful, ignorant message, considering the United States had accepted far fewer refugees in recent years than any of its allies in Europe (low thousands in U.S., compared to the millions over there), where the crisis is being dealt with on the ground, and its foreign policy idiocy bears primary or significant responsibility for the destruction of the nations from which the refugees come – Afghanistan, Syria, Iraq, Libya and others. It was a remarkable image – the old veteran’s banner was at times partially illegible, as the bar holding it sagged a bit at both ends, and he clearly needed another person to hold one end of the bar up. But there was no one to help. 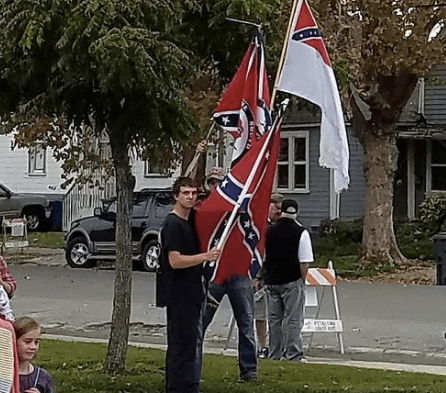 had himself an interesting experience with a trio of white guys displaying a Confederate flag, making the national news cycle. Why Trump Won: The Obama coalition works only if Democrats don’t throw white working people out of the boat.